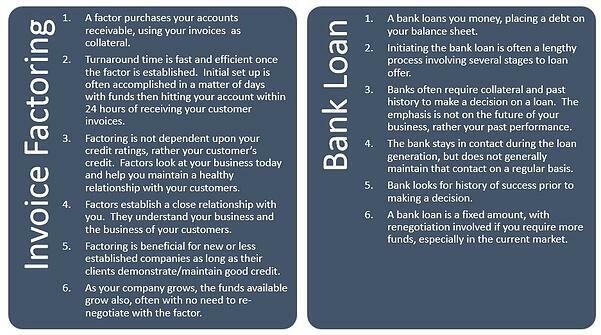 Six reasons to choose invoice factoring over a bank loan. Do you need extra cash for your business? The first option that springs to mind is a bank loan, but this may not necessarily be the best answer. You may consider factoring as a last resort, simply because historically you have heard this is only for businesses with cash flow problems and limited available lines of credit. This is certainly a scenario for invoice factoring, but it is simply not the only reason to consider factoring your accounts receivable. Invoice factoring is more than a last minute fix for a cash flow crisis. It offers a viable and sound alternative to a bank loan. Whether you are an established business, with a proven track record or a new business without a solid financial history.